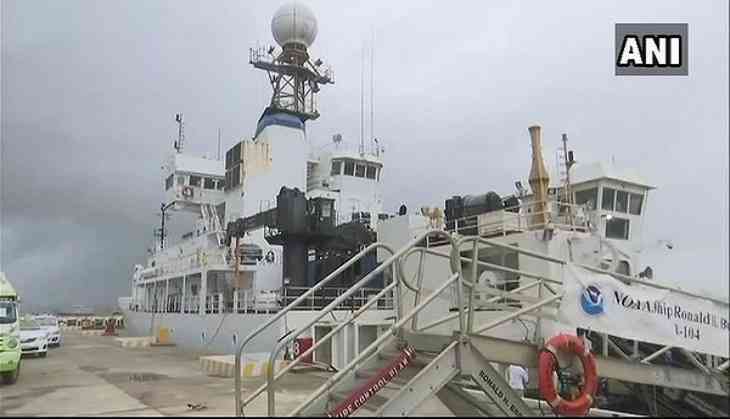 A team of 20 scientists, along with a key vessel - Ronald H. Brown - of the US-based National Oceanic and Atmospheric Administration (NOAA) have arrived in Goa to study the Indian Ocean. The U.S. Consulate General, Mumbai in association with the NOAA has arranged for the tour of the global-class oceanographic and atmospheric research platform. The ship arrived at the Mormugao Port in Goa on Monday. "We are extremely proud of the collaboration between US and Indian scientists. It shows our ability to work together on problems that affect people in both countries," U.S. Consulate General to Mumbai, Edgard Kagan told ANI. The US scientists said this study will strengthen the bond between India and US. "We have relationships with other countries, but with India, its first level of engagement. Indian scientists' contribution to understanding of Indian Ocean is huge," said United States NOAA Assistant Administrator for research and acting chief scientist, Craig McLean. Accompanied by Indian scientists, the team will jointly collect data on changes in the temperature, salinity and other less known components of the Indian Ocean.